This antique Republic truck sign is shaped like a shield. It bears the logo and colors of the Republic company – a trio of stars against a blue field, and nine vertical alternating stripes of white and red on the lower portion of the shield. 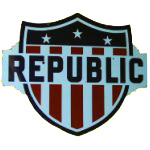 The word “Republic” appears in large block letters across the center of the sign.